Some institutions don’t have their own rooms to come home to. Their work lives outside. They are always guests in other communities. They are always outsiders, asking to come in. Cornerstone Theater works this way. The theater company co-creates all of its productions with people in different communities across the country. They often create productions in cycles, bridging many communities through sequential productions with related—but unaffiliated—groups. In a cycle about AIDS and its impact on the Los Angeles African-American population, they co-created one play with gay black men and another with members of black churches. In each case, they were entering a different community, with different cultural codes, with the intent to work together on a project that unlocked meaning for everyone. There’s a reason angels often show up in stories as outsiders seeking refuge. Outsiders have low status. If they are invited in, they become guests of the insiders. They participate on the terms of their hosts. They thrive—or not—based on their ability to be relevant to the customs of the room. When organizations show up as outside guests, they humble themselves. They throw off the high status of budgets and buildings. They are people, coming to create work, hoping to be of use. It changes the dynamic. It opens new doors into the work and the communities themselves. In New York, The Laundromat Project has created a kind of hybrid guest/host model. It’s a nonprofit organization providing artist residencies and art workshops in neighborhood community centers that already exist: laundromats. Founder Risë Wilson realized that laundromats have three key ingredients that make them ripe for artistic intervention. They attract diverse, local people, many of whom are lower-income. People in laundromats have downtime while waiting for their laundry to finish. And laundromats engender a sense of casual community in a neighborhood. They are the kind of “third places” that urban theorists talk about when describing the places beyond home and work that build community. The Laundromat Project works with artists to spark creative experiences with everyday people in their everyday lives in existing neighborhood anchors. While it started with laundromats, artists now also work in salons, libraries, community gardens, and parks. It’s all about meeting people where they are. Over the years, The Laundromat Project artists have produced projects that transform the physical sites and uses of laundromats in co-creation with customers. In 2007 in Bedford-Stuyvesant, artist Stephanie Dinkins built a “book bench” and free book exchange outside GiGi’s Laundromat, inviting people to read freely in a neighborhood where the library had recently closed down. In 2011 in Jersey City, artist Karina Aguilera Skvirsky set up an oral history booth inside Lucky Laundromat. She collected customers’ stories of neighborhood gentrification and change and transformed them into a set of postcards featuring drawings, photographs, and quotes from customers. Lucky Laundromat set up a rack and distributed the postcards after the residency was over, keeping the art–and the community conversation–moving forward. In the summer of 2013 in Harlem, artist Shani Peters created the People’s Laundromat Theater–an independent film festival of short artists’ films playing 24/7 at the Clean Rite Center laundromat. Customers watched, commented on, and rated the films. Neighborhood enthusiasts joined the Wash + Fold Film Club to promote, plan, and participate in related art workshops and events. The festival culminated with a red carpet awards ceremony, with winners as voted on by Clean Rite customers. Any of these projects could have worked in a traditional art gallery or museum setting. I could imagine an incredible institution called The Laundromat Project, full of artists doing powerful socially-engaged work. But that institution would be a place you would have to choose to go visit in your free time. It would be a building with operational costs. It would have more limited open hours and a lady at the front desk and a whole lot of things that make it very, very different from the laundromat on the corner. By entering neighborhood establishments as guests, The Laundromat Project artists spark new connections on the block through creative projects in places that already matter. Hopefully, they already matter to the artists themselves. The Laundromat Project encourages artists to work with laundromats in their own neighborhoods, or neighborhoods in which they are deeply invested. They use their art to spark dialogue in communities already connected by place. While the artists’ work is new to the laundromat environment, the artists are thoughtful guests. They demonstrate commitment to their laundromat hosts. They work with laundromat owners to plan their activities, making sure the projects can live happily onsite and, where possible, live on beyond the residencies. They build relationships that last, rooted in humility and the desire to participate. Cornerstone Theater and The Laundromat Project both come into new communities by listening. They both spend months getting to know their host communities, building trust before building projects. 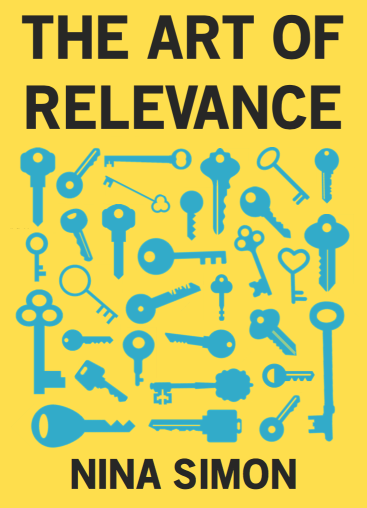 To be able to do their work, they have to demonstrate relevance. If a community doesn’t see the value in what they offer, they can’t succeed. Their vulnerability gives them the courage to pursue relevance fully. If a community doesn’t see the value in what they offer, they can’t succeed. At the deepest level, all institutions are subject to this fact. But few of us put our stakes in it the way itinerant organizations must. If you had to leave your home in the night, would your community of participants take you in?